Deer Hunter 2 is similar to Glu's other recent release ATV Offroad Fury in that they're both enjoyable enough, but ultimately left me a little wanting. They aren't shallow in a one-button, addicting way like Skipping Stone, but instead they're shallow in a way that seems to indicate that with a little more development time and a slightly more ambitious design document, they could have been something really good. Luckily Deer Hunter 2 pretty much nails all the really important gameplay fundamentals, pushing it above the all-important 50% mark (albeit not by much). 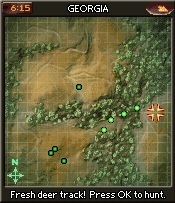 Gamers begin their hunt on the an overhead map - what the game refers to as the "GPS tracker." As you move the cursor around you'll come across deer tracks - either old, or fresh. Find a set of fresh tracks, and you've found your deer. At any time (fresh tracks or no), you can press "OK" to zoom in on that spot and begin your first-person hunt. While in the first person viewpoint, left and right allow you to view your surroundings (a full 360 degrees), up allows you to select your desired weapon, and down switches between your available calls/scents. Simple. Hitting "OK" again zooms into your weapon view, which changes depending on the weapon equipped. Scoped rifles have extreme magnification and aiming reticules, while bows offer you much less help. A nice touch is that your aim constantly slides up and down and side to side, adding some challenge to lining up your shot. A numerical hotkey steadies your nerves for a few seconds, thankfully. That's basically all there is to it. There are different locations and different seasons to go on hunts, but I found they made no difference at all. After a few rounds I could enter any of the three areas any time of year with any combination of weapons/gear and bag my three deer limit in no-time. I beat the entire game and bagged over 120 deer (the game keeps track) without ever being required to actually use my gear. What's the use of having antler calls, scent stoppers, and other trickery if all they do is lengthen the time it takes you to start bagging deer? They were never necessary. As I said, the fundamental aiming/shooting is solid and enjoyable, but I can't help but think some depth could have been added. Perhaps a career mode where you earn money for your kills to buy more ammo or rifle upgrades, or compete in missions with specific goals (time limits, ammo limits, etc). Or some differences between the locations that aren't just cosmetic. The final challenge, killing the "legendary" white stag, is a good illustration. I was expecting an epic battle, requiring me to shoot the stag multiple times while tracking him all across the map, using all my various tricks. Instead, it's just like every other hunt except the deer is... white (and a little faster). Scroll around until you find fresh tracks. Hunt in that spot. Line up shot, and kill. I understand that the title is a bit of a balancing act. Glu has to keep the hunting action fast, and much less methodical than real hunting, thanks to mobile gaming's "bite-sized" nature. But that's what the included "shooting gallery" mode is for. 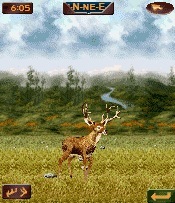 Deer Hunter 2 is still fun, but it would have been more enjoyable if the career mode had some more meat on its bones.